Explore the Gwynne...the Gwynne Conservation Area welcomes visitors all year. The Gwynne Conservation Area is open during daylight hours for non-consumptive uses such as hiking, dog walking, photography, and wildlife observation. Exceptions will be posted. Visitors are welcome to explore the grounds, enjoy the outdoors, and observe the various conservation practices installed throughout the area. Hunting and fishing are not permitted. Use the US Route 42 exit (#79) from Interstate 70. On US 42, go south toward London, Ohio. Go west (toward Springfield, Ohio) on US Route 40. Proceed to the first traffic light and turn right onto St Rt 38 north. Cross over the freeway and turn left at first road (Arbuckle Road). Proceed about 800 feet to the entrance to the Conservation Area parking lot on the right. Use the State Route 56 exit (#72) from Interstate 70. On SR 56, go south toward London, Ohio. At first traffic light (US Route 40), turn left. Go to second road on the left (Gwynne Road) and turn. Proceed to the end of Gwynne Road and turn right onto Arbuckle Road. The entrance to the Gwynne parking lot is approximately 1 mile on the left. *Note: A pass and ticket, specific to the Conservation Area and attained with special permission prior to the event, will be required to get to this point on Arbuckle Road. A deputy will be stationed at a checkpoint to control access. 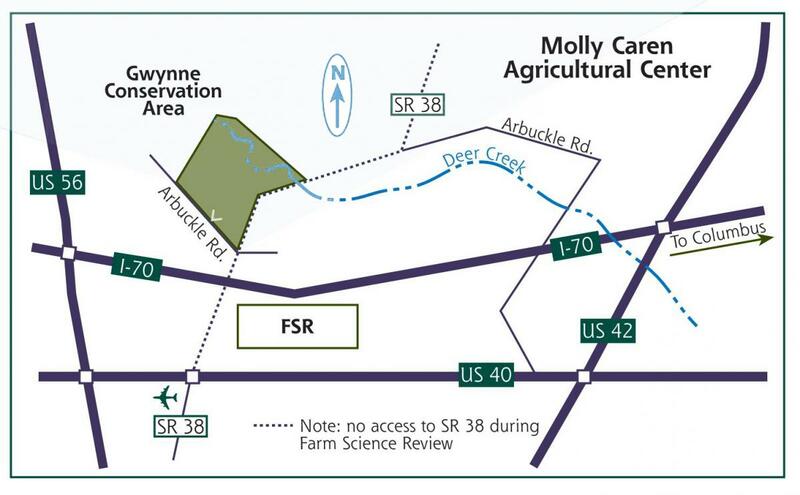 To access the Gwynne Conservation Area as a visitor to Farm Science Review, please follow traffic flow signs to one of our visitor parking areas. Shuttle wagons are provided at the West end of the exhibit area in front of the Fendrick Headquarters Building. For handicap access, golf carts are permitted to drive being cautious of the shuttles. Other handicap assistance is available if not visitng the show using a golf cart.